Who would bear the brunt of increased US protectionism? In this study, our economists assess the impact of US trade protectionism, centering on China. The goal is to examine which countries and industries would ultimately bear the brunt should the US step up trade protectionism. Our team’s primary focus is to resolve the biggest trade misclassification in Asia – i.e. disentangling the foreign value-added in China’s gross exports and reassigning it back to its original source countries. In this study, our economists and strategists assess the ultimate export exposure of 38 countries and 11 industries to the US. According to our economists, the most exposed countries (in descending order) are Vietnam, Canada, Ireland, Malaysia, Mexico, Thailand, Singapore, Korea, Switzerland, Chile and Israel. Asia is the most exposed region – six of the top 10 exposed countries are Asian – as the foreign value-added in China’s exports is reallocated back mostly to other Asian countries. 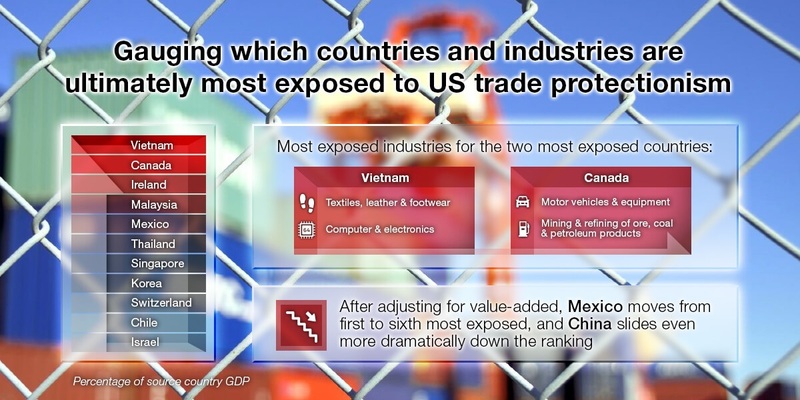 The most exposed industries vary widely by country, from textiles, leather & footwear in Vietnam, to motor vehicles & equipment in Canada. Our FX strategists expect Northeast Asian FX to underperform on increased protectionism as negative macro and geopolitical risks rise. Policymakers may also shift to pro-growth policies including FX flexibility. In Southeast Asia, we would expect SGD and MYR to underperform. In LatAM, MXN would suffer, while CLP would sway between US and China factors. EEMEA would be less affected, with ILS possibly outperforming despite Israel's exposure to the US. Click here to view the full report with detailed analyses on export exposure to the US, and the hazards trade protectionism would pose on emerging markets FX. Is the US economy not as dynamic as it used to be?